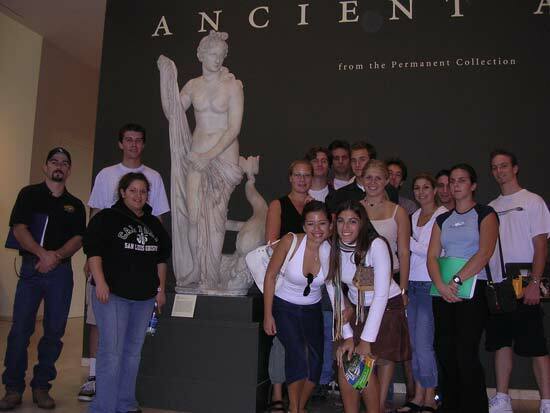 On Friday March 3, the class will take a field trip to the Getty Villa in Malibu, part of the Getty Center, one of the prime museums, cultural centers and architectural wonders of the world. The Villa opens one month before our visit after having been closed several years for major renovations. Designed like a Roman Palace of the first century, the Villa has a fine collection of ancient art and artifacts that illuminate our readings. Please reserve this date on your calendar now and try to schedule labs, work hours and other class obligations to allow you to participate. If you cant make the trip on this date, arrange to go at another time. The English Department and the College of Liberal Arts subsidize this trip, but students are expected to contribute ten dollars toward the bus fare. Please bring a check for this amount to class on Wednesday January 18, or if you are not going on the bus with the class, hand in a statement of when you are going. The bus leaves promptly at 10:15 A.M. from in front of the English building and returns there at 10:00 p.m. There will be one pit stop on the way, but bring along a lunch. The bus will arrive at the Getty around 1:30. The class will remain together in the ancient art exhibit for about an hour and a half, and then people are free to wander in the galleries and gardens. The bus will depart at 5:00 p.m. and we will stop for an early dinner at a reasonable place to eat before heading back. We will be back on campus by 10:00 P.M.
Study the items on display at the Getty Villa listed below and select three that appeal to you. Relate each to specific passages in works we have read or to lectures or class presentations. Do some research on the Getty website and elsewhere to find information about the works, the artists, the circumstances of their production. Be ready to give the group with which you tour the museum a detailed description of what you see in the works literally, emotionally and symbolically. Write up your description of one of these works in a paper of about 750 words you submit either on Wednesday March 8 or on the Monday following your visit. Include a printout of the picture from the website or your own photo or a sketch you make of it in the museum. Be sure to include a few sentences about how encountering it in "the flesh" is different from encountering it on a computer.